An assortment of our handmade pizzas featuring a variety of crusts (white, Good Grains whole wheat, flax seed and oat, flatbread), sauces (red, cheesy alfredo, basil pesto, sun-dried tomato pesto, barbecue, balsamic glaze, ranch dressing), and toppings (sausage, pepperoni, chicken, ham, meatballs, tomatoes, peppers, olives, mushrooms, tomatoes, basil, mozzarella). Create your own combinations or let us select them for you. Typical order allows three slices of pizza per person. Accompanied by fresh-baked cookies for dessert. Served with iced tea, lemonade, and water. *Ask about our gluten-free options. Our Just Pizza buffet, plus a giant salad to go along with it. This classic salad features mixed greens with cucumbers, carrots, and grape tomatoes. Dressings include balsamic vinaigrette and buttermilk ranch. Accompanied by fresh-baked cookies for dessert. Served with iced tea, lemonade, and water. 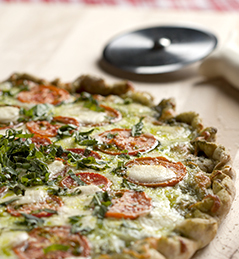 Our hearty stuffed pizzas, available for meat-lovers or vegetarians. 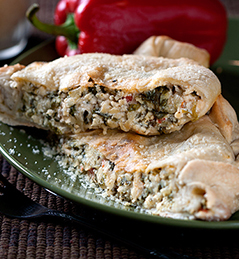 All calzones are filled with ricotta, mozzarella, and aged parmesan cheeses. We add sweet Italian sausage, pepperoni, and meatballs for the meat calzone or artichoke hearts and baby spinach for the vegetarian option. Both served with marinara sauce to top them off. Includes classic Caesar salad and fresh-baked cookies for dessert. Served with iced tea, lemonade, and water.